Joan of Arc, also referred to as Jeanne d'Arc, was a French woman who campaigned in the Hundred Years' War against the English, winning countless battles while following visions she claimed were from three holy saints. She was eventually captured and tried for heresy, due to wearing male clothes; she was found guilty and shortly executed, though years after her death, she was canonized as a patron saint. In Mario's Time Machine, Mario travels back in time and returns her Shield to her after she loses it. Joan of Arc was an illiterate, small-town girl born in the 15th century. She was driven to fight against the English troops by three angelic saints. At the age of seventeen, she fought alongside the French troops, armed with a sword from a church dedicated to Saint Catherine and custom armour. She led an army of 4000 troops to the city of Orleans, lifting it of its siege. Her army swept through the country, allowing the Dauphin of France to be crowned king Charles VII. However, she was eventually caught by the English and tried for heresy. In 1431, she was martyred, though she was later cleared of the charges and the Catholic Church made her a saint in 1920. 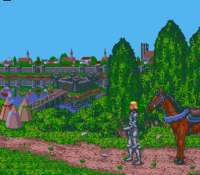 Joan of Arc in the SNES release of Mario's Time Machine. Bowser, who wants to create a museum using stolen artifacts, goes into a time machine and steals objects from their proper time period, which includes Joan of Arc's shield. Mario attempts to return these stolen artifacts to their rightful owners, eventually flying to Orleans and meeting Joan of Arc. When she is first met, Mario's only option is to ask her about the ongoing battle, to which she replies that she was struck by an arrow and lost her "buckler" afterwards. She can only be given her shield after Mario talks to the various soldiers in the nearby camp, including the Duke of Alençon, and finds out her entire history. Once she has her shield, she thanks Mario for his help, directly mentioning his name, and prepares for her attack on Orleans, vowing to not let it stay under siege. If Mario asks how she knew her name, she states simply that it came to her in a vision. This page was last edited on February 7, 2019, at 03:04.